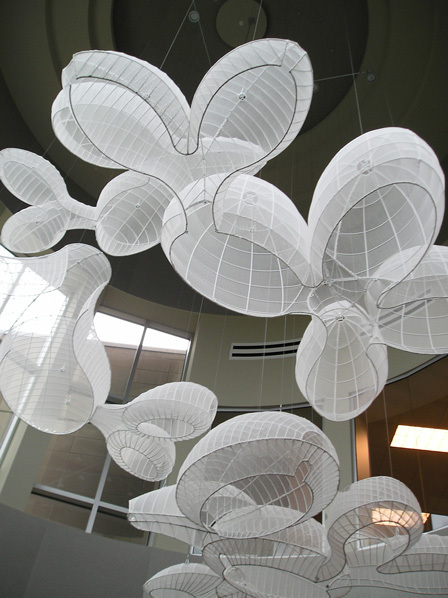 This variation on Parabiosis was commissioned by the Markel Corporation in Richmond, Virginia. It was designed and built specifically for an unusual cylindrical shaped boardroom with a high ceiling and clear story windows. Five separate forms were suspended at various heights, but when viewed from below in the boardroom they appeared to overlap and merge. These were non-identical forms, but of a like phenotype. They inhabited the region marked by the circular band of the clearstory windows and suggested a potential to float and reconfigure at any time.